Green Key awarded Sinatur Hotel Frederiksdal, located north of Copenhagen (Denmark), is one of six hotels in the Sinatur Hotel Group that combines nature, gastronomy and hospitality with a personal touch. After completing the renovation of the breakfast area at the Brighton Restaurant, the Stanhope Hotel decided to change the complete layout of the breakfast buffet. Posters and table tents in the Sheraton Buganvilians Resort and Convention Center in Puerto Vallarta, Jalisco, Mexico remind guests to enjoy the buffet responsibly. Green Key awarded Radisson Blu Elizabete Hotel in Riga (Latvia) not only hosts beehives on its rooftop, but also brews its very own honey craft beer. 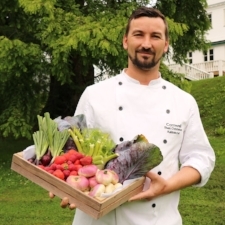 The Green Key awarded restaurant Smakbyn built its business around bringing back the local taste of the Åland Islands. Every Tuesday, the kitchen team of the LUCE Restaurant in the Green Key awarded Radisson Blu Hotel Lucerne indulges their guests with delicacies from the local market – and helps to protect the environment at the same time. very impressive sustainable actions in place. The Sheraton Stockholm Hotel, Green Key awarded since 2012, has developed a comprehensive strategy to work towards a better environment. One of many environmental contributions is their sustainable food policy. At Hilton Copenhagen Airport they wanted to put the focus on food waste, as they found too much food was being wasted.